My family left Kenya when I was 16, and it took me many years to make the journey back. Of course, a lady should never reveal her age…suffice to say, almost three decades had passed before I touched down in Nairobi in December 2017. I really wanted to stay at Hemingways Nairobi because it is situated close to many places which hold distinctly fond memories for me: Giraffe Manor, Daphne Sheldrick’s elephant sanctuary, Carnivore restaurant, Karen Blixen’s museum and my former home on Twiga Hill Road are all a short distance from the luxury hotel. Many friends had warned me that the traffic in Nairobi these days would be a shock. So I am pleasantly surprised when the drive from Jomo Kenyatta airport, along the edge of the Nairobi game park to Hemingways Nairobi, takes less than 40 minutes. The hotel is situated in the leafy suburb of Karen (named after Danish author Karen Blixen, of whom more later), away from the hustle and bustle of downtown traffic in Nairobi, and the roads around the hotel are well-maintained. Upon arrival, I am escorted to the Jomo Kenyatta suite, an amazing 80 square meter room, with a white marble bathroom bigger than my apartment in London. The hotel has 45 rooms, all with private balconies and named on six themes: famous leaders, Hollywood stars, explorers, conservationists, safaris and writers. 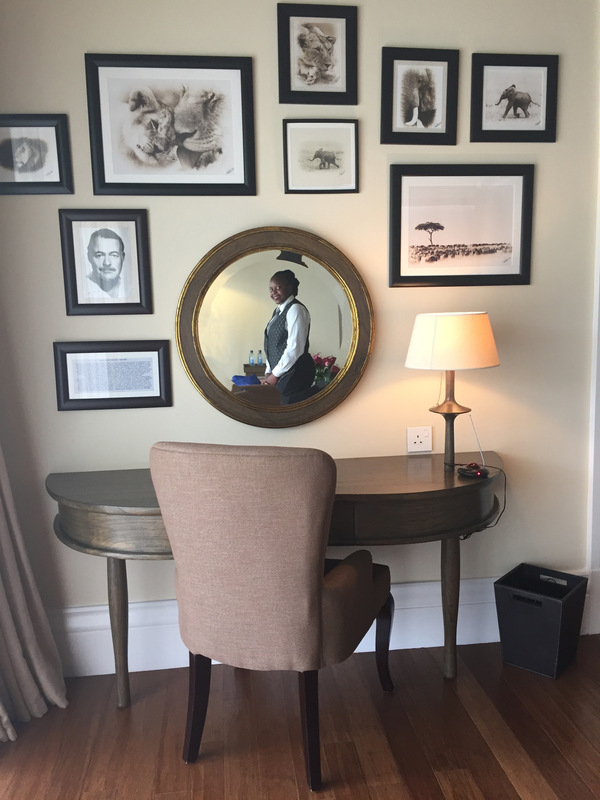 The rooms are all the same size, but decorated differently, with exception of the Hemingway presidential suite and the Karen Blixen junior presidential suite which are larger. 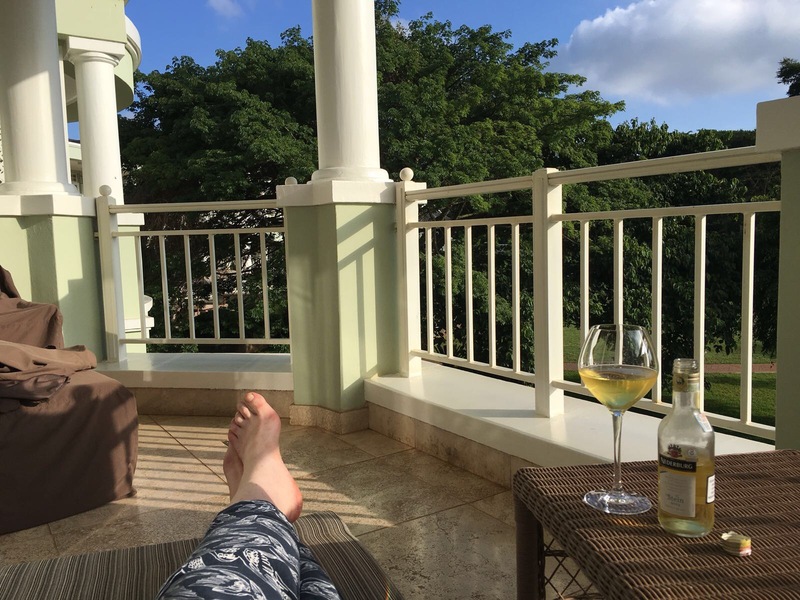 Since the owner of the hotel, Richard Evans, was fond enough of Ernest Hemingway to name the hotel after him, it seems appropriate that the best suite is called Hemingway. I had secretly coveted the Karen Blixen junior presidential suite, but I am shown to a room right next door to it and can finally say, “I had a room at the foot of the Ngong Hills.” If any of you are Karen Blixen fans you will know that she had “a farm at the foot of the Ngong Hills”, and was a Danish Baroness who wrote her first autobiographical book, Out of Africa, published in 1937. Her timeless, romantic novel centres around her lover Denys George Finch Hatton, an aristocratic big-game hunter, made even more famous by actor Robert Redford who played Denys in the film, Out of Africa. I recommend all visitors to Kenya watch it. Sadly my room doesn’t include Robert Redford, but I got the next best thing: a private butler at my service. You can book the Denys Finch Hatton suite, the room next to Karen’s, if you desire. Hemingways Nairobi Hotel is built on the old coffee plantations of Karen Blixen at the base of the Ngong hills. You can take a day trip there for a picnic and stroll among the grassy parks and lands of the Maasai. The decor of the hotel reflects heroes of a lost age, with old silver aeroplane blades gracing the hallway as art, and pictures of great white hunters abounding the halls. There is a private landing strip at Hemingways, reminding you that the days of receiving guests by private plane are far from over. On my first night, I dine with old friends in the hotel restaurant, on lobster accompanied by a superb bottle of wine. On the dining room wall there are famous quotes that make me laugh. Jomo Kenyatta, is one of the quotes on the wall. I had forgotten that it’s ok to have more than one wife in Kenya and ask my friend if the average man still has more than one wife. He says it’s less common these days but some Kenyan men who can afford it still choose to have more than one. Jomo Kenyatta had many wives and was the president until 1978, and still popular when I lived in Kenya. I am enjoying staying in his suite, with photos and memories from his presidency. The next morning I opt for a sumptuous breakfast outside. We are offered a la carte with various types of eggs or a continental breakfast. I go for the Eggs Benedict, which is served with special bread baked on the premises. I have a superb cappuccino (of course it’s Kenyan coffee!) served by a fantastically friendly waiter, before taking the Hemingways limo service, complete with on board roaming wifi, and a wonderful driver called John. 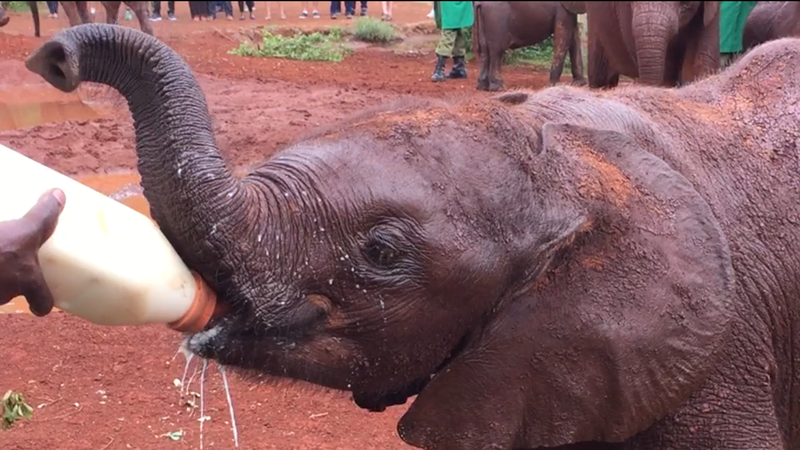 I start my journey back in time with the feeding of Daphne Sheldrick‘s baby elephants at 11 am. This centre was created in 1977 to look after baby elephants whose mothers have mostly been killed by poachers. The centre was a lot less structured back then, you could pop by whenever you were in the area and Daphne herself would often be there. And sometimes a baby Rhino, or other species wandering her grounds. Now there’s a formal time between 11 and 12, where you can watch the elephants. It is a heart rendering experience as these little babies roll in the mud, play with each other and feed hungrily on their bottles. They drink an incredible 24 litres of milk per day. One elephant is cheeky enough to put its trunk up my skirt, but that is fine with me as I get to scratch his muddy little ears. I adopt an elephant that I adore, little Jyoto, and that means I can come back to have a private feeding time with him at 5 pm. The adoption process did not exist when I was a kid – it’s a wonderful idea as it gives guests a chance to be involved in the elephants’ lives and, more importantly, finance their protection. I could have stayed all day watching them but the centre closes after feeding time and I move on to the Giraffe Centre. The Giraffe Centre has also been around since I was a child. 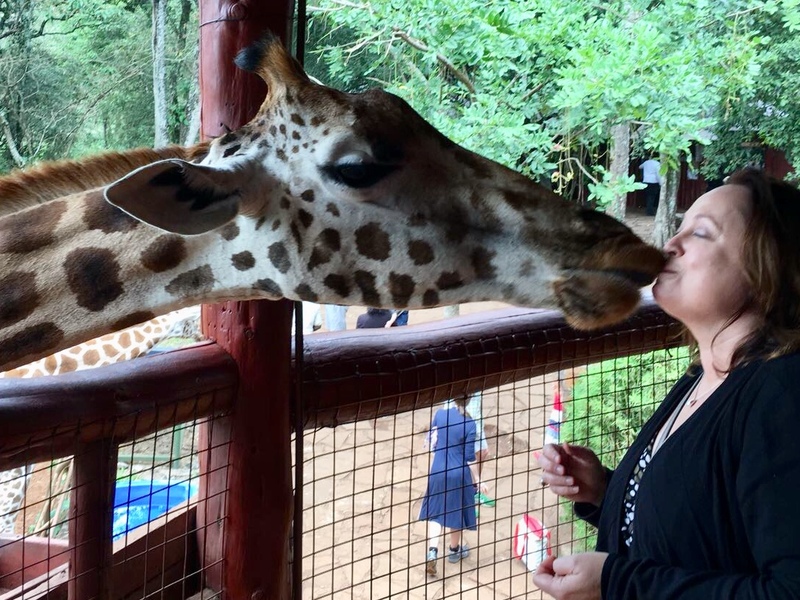 An American lady, Leslie Melville, set up the centre to help save the endangered Rothschild’s giraffe, one of three subspecies that exists in Kenya. The centre is exactly as I left it, except they now have a cafe and gift shop. Oh, and the Giraffe are on a diet. A big sign says, please don’t feed the Giraffe more than two handfuls! 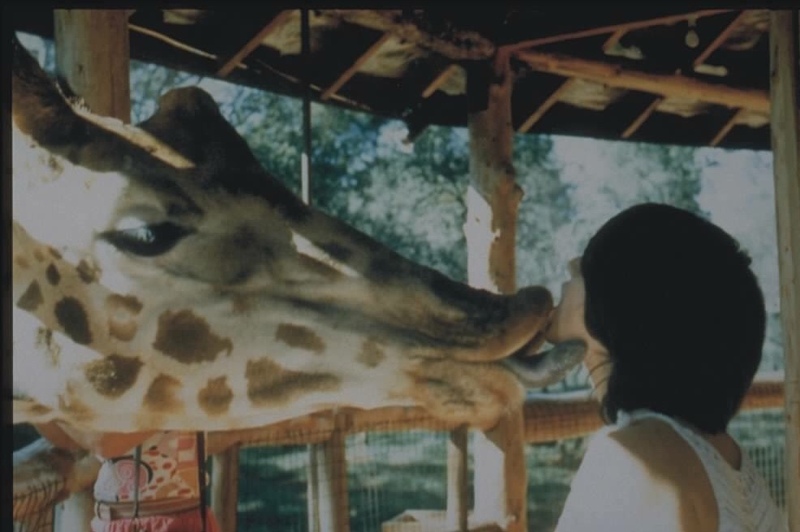 My favourite thing to do at The Giraffe Centre as a kid was to ‘kiss’ the giraffe. I had learned the trick of holding a pellet of food between my lips so the giraffe would have to get it from me with its surprisingly agile large blue tongue. It seems this isn’t widely practiced any more as I get a few strange stares when I start to feed these amazing animals with my mouth. The lady next to me likes the idea and gives it a go, but keeps her mouth open by mistake and gets a blue tongue in it for her efforts. A very big tongue with a lot of saliva, I might add! She shouts really loudly and we all laugh. I tell her what the keepers used to tell me all those years ago: the Giraffe is a miracle, it’s saliva actually has antiseptic in it, and won’t make her sick. She tries again – success! The next stop is my old house, on Twiga Hill Road, appropriately named because ‘Twiga’ means Giraffe in Swahili, and we are ten minutes from the giraffe centre and two doors up from the Karen ducas (Swahili for shops). I look through the gate, down the long winding driveway to see a partition where the land is being divided into plots. Driver John speaks in Swahili to the guards (I have forgotten a fair amount over the years) who say that the place is being sold to a developer and we aren’t allowed in. Dogs come running up from the main house and lick my hands through the gates, just as my dogs once did. I am sad we can’t go in to see the house, but the lands are still the same, with thick lush bougainvillea and frangipani trees along the main entrance. The next stop is the Karen Blixen Museum. Again this is exactly the same except there is now a very nice restaurant next to it. I am given an insightful tour around Karen’s house, and then enjoy freshly-caught Tilapia fish at Tamambo restaurant nearby. Next stop is the Kazuri Beads Factory, started in 1975. The place was nothing more than a home business when I was young. I am lucky to get a tour right away and am shown the production of the high end beads and pottery from beginning to end. 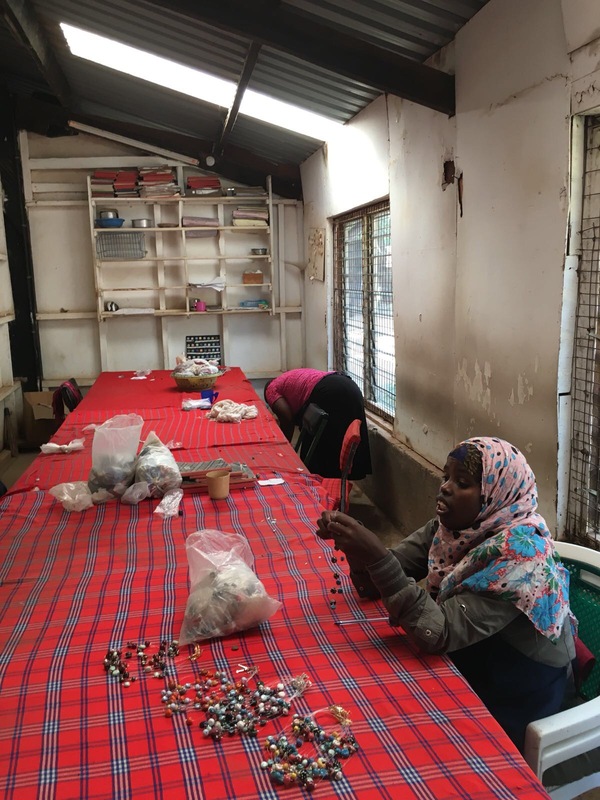 The industry employs mainly women and it’s fascinating to see the process and see the high quality jewellry and crafts that come out at the end. I buy a beautiful necklace with matching bead earrings from the shop, and they are unique, colourful and inexpensive. building and also have an on-site cafe. Having managed to see most of what I wanted to see in the area within one day, I treat myself to a day by the pool and at the spa the following day. I indulge in some downtime at Hemingways before heading off my next destination, the Safari Cottages at the Ol Pejeta reserve. Safari is a Swahili word meaning journey that some say was put into popular use in the English language by Hemingway himself. From a Moran, to a Tour Guide. Led by his love for wildlife, Raphael Rotiken ditched Moranism and became a Tour Guide with Hemingways Ol Seki Mara Camp.